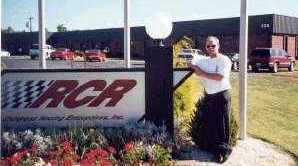 They had one of Dale's retired cars there with his big hauler. The second pic is of both of us by the car. The funny part of this story is, we knew how much admission to the track was, so we counted our pennies and traveled the 50 kilometers to go to the races and see Dales car. When we got there we found out that they had upped the price because it was a special event, and we didn't have enough money for all three of us to get in! My husband is the biggest Dale fan, but he was kind enough to let me go in with my son, because he is such a gentleman :) Poor Tom passed up the only chance we have ever had to see a real NASCAR stock car! We never stayed to see the races, Tom peeked in the gate to see the car and then we just turned around and drove all the way home. We got some good pictures for him though! 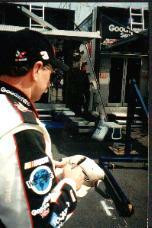 My husband of 38 years has been a Dale Earnhardt for years. 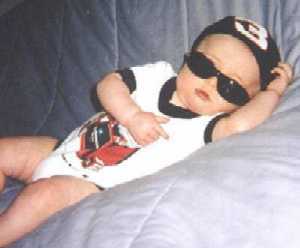 I was never real interested in racing at first, suppose I had things to do on Sundays since I was a working mother of 2. He would holler at me from the living room to get in there and see what “The Man “ had done on the racetrack. Of course I would go but not very interested. As the years went by I got to enjoy them a little more. Our children were grown by then. Then on a beautiful Saturday morning in September 1986 our lives changed. Our only son was killed in a farming accident. 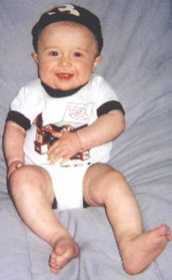 (It seems like only yesterday) At that time our daughter had 1 son, that was our only reason to smile. (I should say “they” were the only thing we had to smile for) Our lives were in such disarray. But as I’m sure you know (in one way or the other) life goes on, hurting more and more but it still goes on. As the pain started to lessen, we got back into watching racin. But it was different this time; I was right by my husband’s side. Most of the time our daughter and grandson was there too! It was our time to forget, because in 3 or 4 hours the pain was back. (The race was over.) Well by this time our daughter and myself and even our 15-month grandson was really enjoying racin. And then in 1995 we were able to get tickets to Indy. How life changed. Since then we have been able to go to 2-3or4races a year. Sometimes by ourselves and sometimes with our daughter and (now) grandsons. 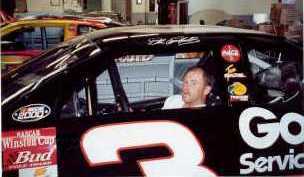 In 1997 we got to go to Daytona for the first time. We are from Illinois so we would make that our vacation. Really just to watch “The Man in Black.” In 2001 my husband was not feeling well but he had gone to the Dr. and she had put him on medication so we took off. By the time we got there he was really sick, but of course he would not go to the Dr. Then race day came! We had got revised tickets in the new “Earnhardt Tower”. He was so sick he had to sit down 3or4 times before we got to them. Just before Steward’s wreck he went down to the truck. 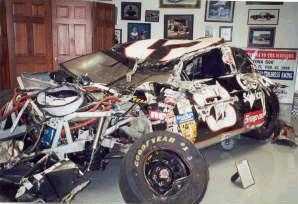 I stayed to make sure Earnhardt got through all right. Got concerned about him and I left to. Didn’t know anything about the wreck until I got back to the truck. Last I heard on the speakers was: Michael-1 –Dale Jr.2-Dale Sr.3. My husband had the radio on in the truck so he knew the wreck had happened. Before we got back to our motel a man on the street came up to us (of course we have #3 on the back window of the truck) and told us that he had died. In shock we drove to our motel, had a drink and my husband said to me” Lets just get some sleep and deal with this in the morning. The next day he was so sick I talked him in going to hospital. They admitted him for 4 days with pneumonia. We live in a town with about 100 people and there I was in Daytona all by myself. Of course I wouldn’t let anyone fly down to be with me, just hung in there until he got well enough so we could start home. Took us 31/2 days to get here. And then the tragedy set in “Our Hero was gone” One year and 2 months later I’m really having a hard time with this. Not over the shock of my son (15 years ago) and now my hero. 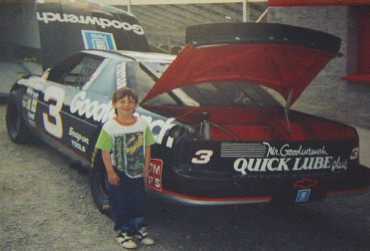 i came across your earnhardt page and just wanted to say how much i liked it. 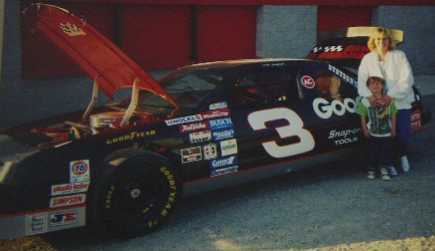 i watched nascar since i was 3 and i was brought up as an earnhardt fan, im a huge fan of is, i have a huge collection of his stuff, and its still really hard for me to get over this. i mean im not a wuss but some nights i lay there in bed and think of memories of dale from the races i got to pocono every year, and the talladega race i went to and i cry. and i`ll never forget the 2001 daytona 500, me and my frinds watched it, when we saw earnhardts wrec we were pissed but we went out and thought not much about it, when i got home my dad told me to turn on cnn, when i did i`ll never forget what i saw, the reporter standing outfront of the hospital and in big letter it said "Earnhardt dies in crash" i broke down and was crying i dindt eat for 2 days i just sat in my room with my autographs of him and his collectible and though about the time i met him at pocono and watched the tributes on tv and i will never forget that, it was like losing a family member. 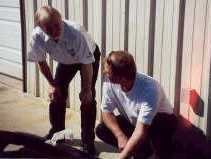 Sept. 2001-I owe great thanks to larry childress for allowing me to sit in one of the intimidators cars , i also was given the entire rear (GOODWRENCH PLUS) decal from the back of his car so i have a very small piece that means more than words can describe. We live in Richmond, Virginia and Brian is 7 months old in these pictures. My grandfather who was the biggest Dale Earnhardt fan ever, died before Brian was born and these pictures are a tribute to him. He would have been very proud to see Brian all decked out in #3. He actually died a few months before Dale did, which is kinda weird because I know that he wanted to meet Dale one day, and now I am sure that they have met now and are good friends. Thanks for enjoying these pictures as much as I do. on sunday the 18/2001 at 4:16 CST i was in shock,devastated to be more exact,that evening i took 3 phone calls from friends that had heard the news ,after that i told my kids to take the calls and they estimated approx 50 calls from both canadian coasts and one from mexico (friends vacationing) i just couldnt bring myself to speak to any one else. my children kept staring at me (they hadnt seen their father cry before) i had to leave the house so i walked and walked trying to comprehend what had happened. i received a sympathy card from my sons hockey team , and almost cried.the boys were afraid to even look at me,they all knew i was hurting. any way my name is just how i feel even today. I MISS YOU DALE!